MOSCOW (AP) — For yet another weekend, thousands rallied across Russia on Saturday to protest the government’s plan to raise the eligibility age for retirement pensions by five years. 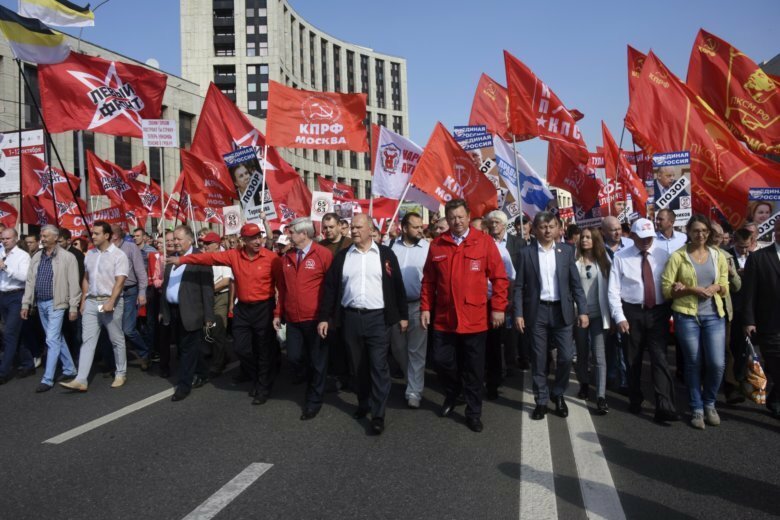 Several thousand people attended a Moscow rally organized by the Communist Party and other leftist groups, which was authorized by city officials. Communist Party chief Gennady Zyuganov called for rolling back the proposed changes, arguing that the government should redistribute resources to avoid raising the pension age. “They keep reaching into your pockets,” he told protesters, who waved red flags. The government’s plan to lift the retirement age to 65 for men and 60 for women has irked a wide range of Russians from all political factions. Older Russians fear they won’t live long enough to collect significant benefits while younger generations are worried that keeping people in the workforce longer will limit their own employment opportunities. The proposal has also dented President Vladimir Putin’s popularity. “It can’t be that our country doesn’t have money for its people, the people who spend their whole lives working and paying deductions for their pensions,” he said. Similar protests were also held Saturday in many cities across Russia’s 11 time zones, most of them sanctioned by authorities. Several hundred demonstrators rallied against the pension age hike in Sevastopol in Crimea, the Black Sea peninsula that Russia annexed from Ukraine in 2014. “This is a very serious issue for me, because it touches upon my life, my children, my parents who haven’t retired yet,” said Olga Konitskaya, 30, a protester in Sevastopol. The demonstrations went on peacefully, unlike a wave of unauthorized pension protests earlier this month organized by opposition leader Alexei Navalny that led to the detention of over 1,000 people across Russia. Navalny, the anti-corruption activist who is Putin’s most visible foe, had called for protests against the pension age hike before he was sentenced to 30 days in jail for organizing a January protest over a different issue. He is set to be released from custody Monday. Putin has responded to the protests by offering some concessions, but argued that the age hike is necessary because rising life expectancies in Russia could exhaust the nation’s pension resources if the eligibility age remains the same. The Kremlin-controlled lower house, the State Duma has given only a preliminary approval to the pension changes bill and is yet to hold a decisive second reading. Iuliia Subbotovska in Moscow contributed to this report.